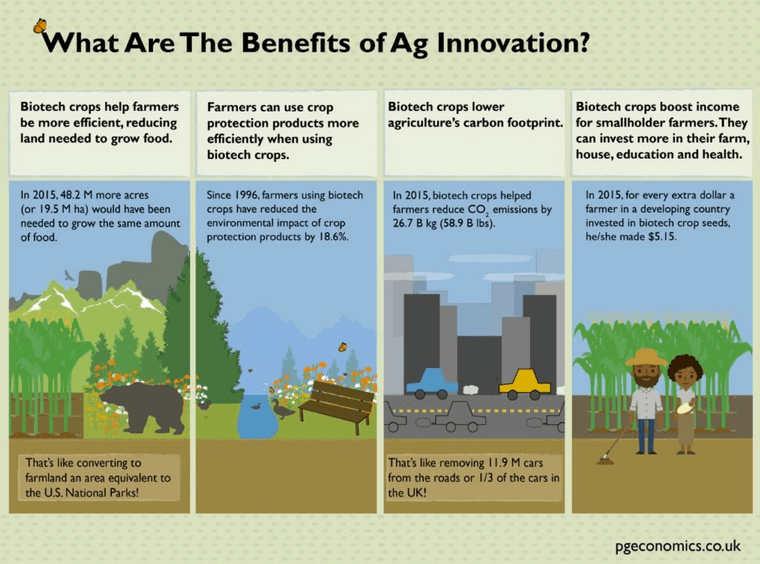 This is the second in a three-part series making the case that the development of the biotech traits for insect resistance and herbicide tolerance are the most substantial innovations in sustainable agriculture in the last three decades. In part one, I laid out the context in which I believe they should be assessed relative to other innovations competing for the crown. 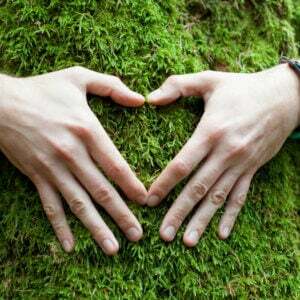 In this part, I examine the data and evidence of their overall environmental impacts. In the final installment, I’ll make my closing argument after looking at the impacts on China, India, Pakistan and South Africa. 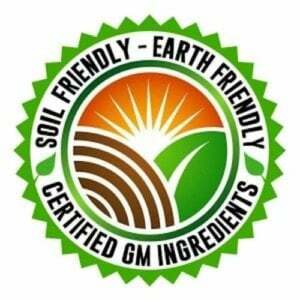 Every year, the agricultural and natural resources industry consulting firm updates their magisterial literature review and data analysis [PDF] on the global impacts of GE crops. It takes the peer reviewed research literature and public data pulls it into a systematic attempt at quantification. I’ve asked people I respect about the quality of this work. And no one I’ve talked to has found any reason to see the effort as flawed, nor have I come across any written critiques anywhere. I find the report to be transparent, well sourced, and forthright about methodology and the limitations of their methods. Some of these are based on complex calculations with wide margin for error. But even taken as back-of-the-envelope math (and it’s far more sophisticated than that), they lay out the scale of these impacts and define the bar if you want to put forth some other innovations as having had greater impact. Globally, permanent savings in carbon dioxide emissions (arising from reduced fuel use of 9,823 million litres of fuel) since 1996 have been about 26,221 million kg, with the additional amount of soil carbon sequestered since 1996 has been equivalent to 227,208 million kg of carbon dioxide that has not been released into the global atmosphere. In the US the combined numbers for corn and soy are a savings of 2.8 billion litres of fuel from 1996-2015 and 72 billion kg of carbon emission sequestered or saved in reduced fuel burning. 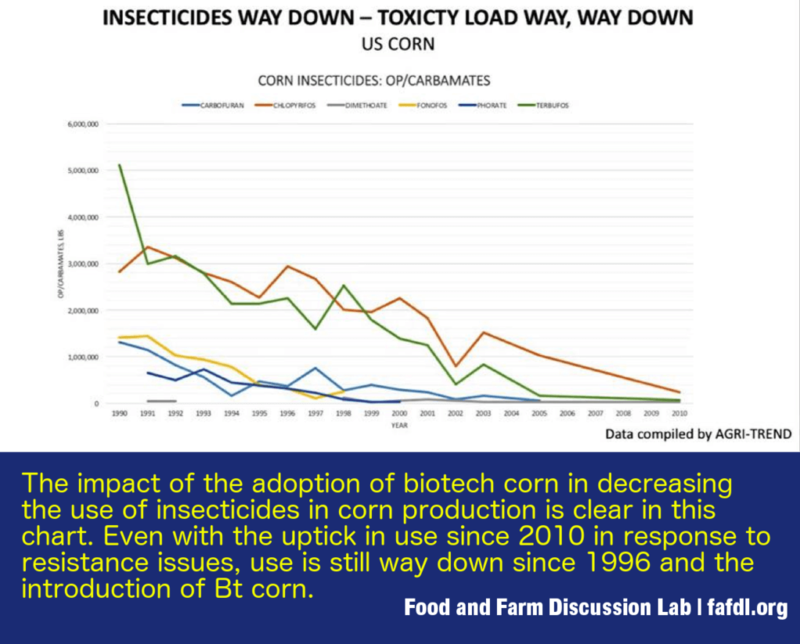 In Bt corn, globally, they find a 53% (87 million kg) cumulative reduction in active ingredient and a reduction of 7.8 million kg for 2015 alone, amounting an 84% reduction for that year. 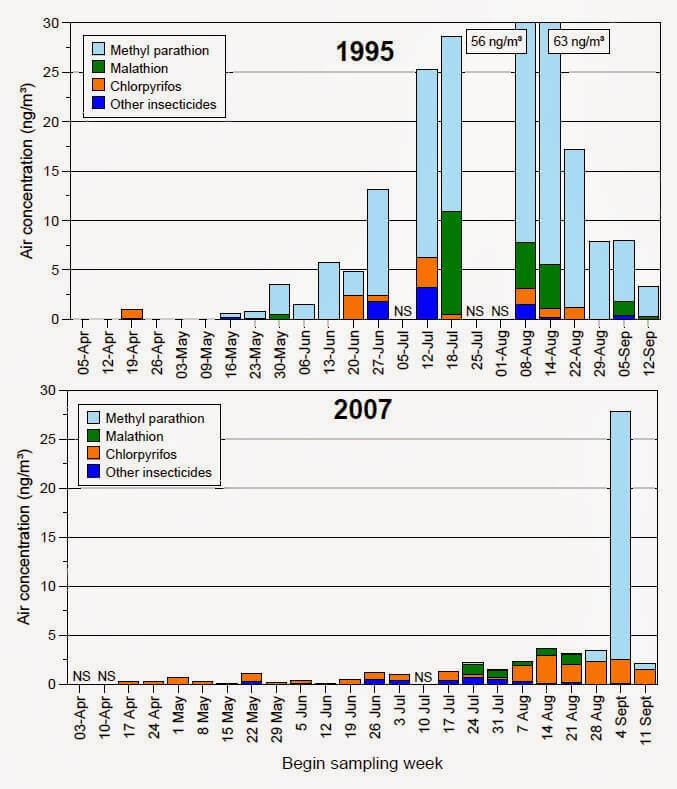 The reduction in organophosphates, some of the nastiest insecticides is even more dramatic than the general trend. That reduction registers in air quality samples. In the interest of space, we’ll just look at the example of Argentina, a non-wealthy nation that bounces in and out of official “emerging market status”. 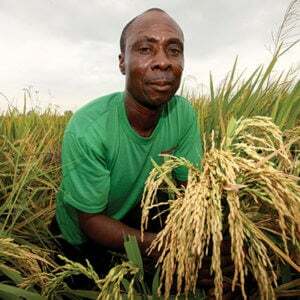 From a development perspective, increasing farm incomes there is a big deal. In Argentina, Brookes and Barfoot found savings from reduced expenditure on herbicides, fewer spray runs and machinery use have been in the range of $24-$30/ha (hectare), although since 2008, savings fell back to $16-$26/ha because of the significant increase in the price of glyphosate relative to other herbicides in 2008-09 and additional expenditure on complementary herbicide use to address weed resistance (to glyphosate) issues. Net income gains have been in the range of $21-$29/ha up to 2007 and $14-$24/ha since 2008. The net income gain from use of the Roundup Ready technology at a national level was $448 million in 2015. Since 1996, the cumulative benefit (in nominal terms) has been $6 billion. An interesting wrinkle is that part of the gains for Argentine farmers is that Roundup Ready soybeans have allowed many of them to grow soy as a second crop after wheat harvest. 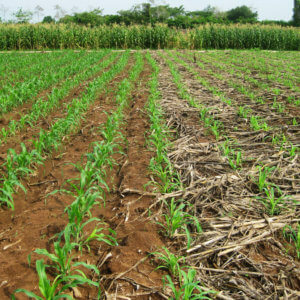 The time freed up by the reduction in tillage practices allows for that second crop. Nearly 20% of the Argentine soybean crop came from wheat farmers supplementing their annual income in 2015, up from 8% in 1996. The represented a $484 million boost to national farm income in 2015 and $11 billion cumulatively since 1996. I want to look at two other areas before wrapping up. The first is sorting out the complicated picture on the impact of Roundup Ready and other herbicide-tolerant crops on environmental impacts. Then we’ll take a look at Bt cotton in India, Pakistan, and China. 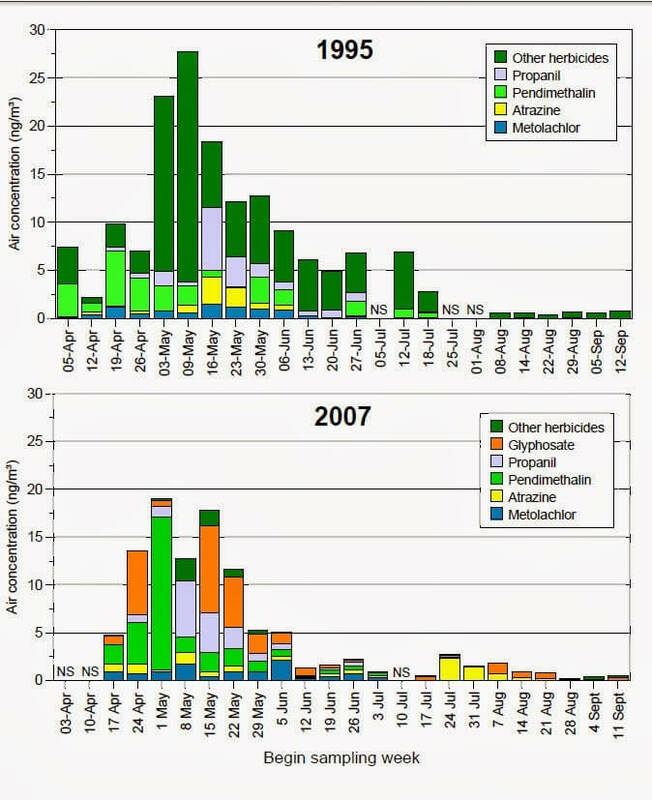 The changes in detected herbicides are less dramatic than those for insecticides, but if you read that shift from green (other herbicides) to orange (glyphosate) you can see a qualitative shift as well as older, nastier herbicides dropped out of use. And to return to a point raised earlier — one that bears repeating for our friends who haven’t internalized it yet — those reductions in insecticide use and herbicide toxicity are happening on nearly 90 million acres of corn and 76 million acres of soybeans in the US. Before we get to Kniss’ paper, let me humbly recommend the primer on “superweeds” I did for GLP a few years back. Here, I analyze data from the International Survey of Herbicide Resistant Weeds and the USDA and demonstrate that adoption of GE corn varieties did not reduce herbicide diversity, and therefore likely did not increase selection pressure for herbicide resistant weeds in that crop. Adoption of GE herbicide-resistant varieties substantially reduced herbicide diversity in cotton and soybean. Increased glyphosate use in cotton and soybean largely displaced herbicides that are more likely to select for herbicide-resistant weeds, which at least partially mitigated the impact of reduced herbicide diversity. The overall rate of newly confirmed herbicide resistant weed species to all herbicide sites of action (SOAs) has slowed in the United States since 2005. 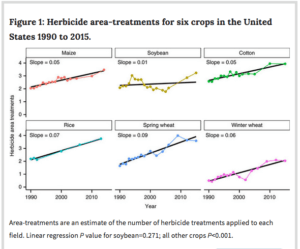 Although the number of glyphosate-resistant weeds has increased since 1998, the evolution of new glyphosate-resistant weed species as a function of area sprayed has remained relatively low compared with several other commonly used herbicide SOAs. 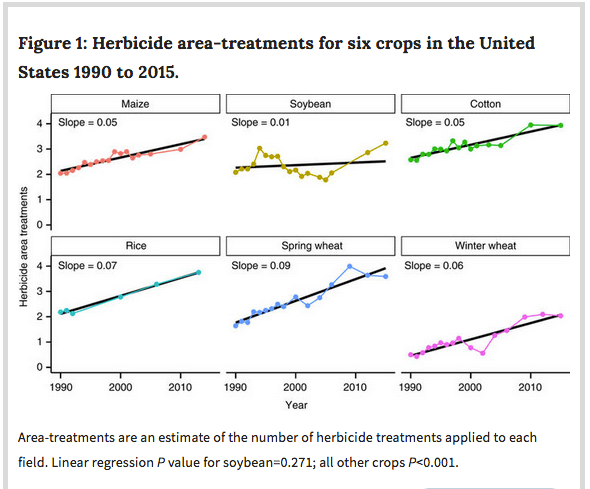 The rate of weeds developing resistance to herbicides has slowed since 2005. There are other herbicides that are more vulnerable to resistance developing in the weeds they are meant to kill than glyphosate. 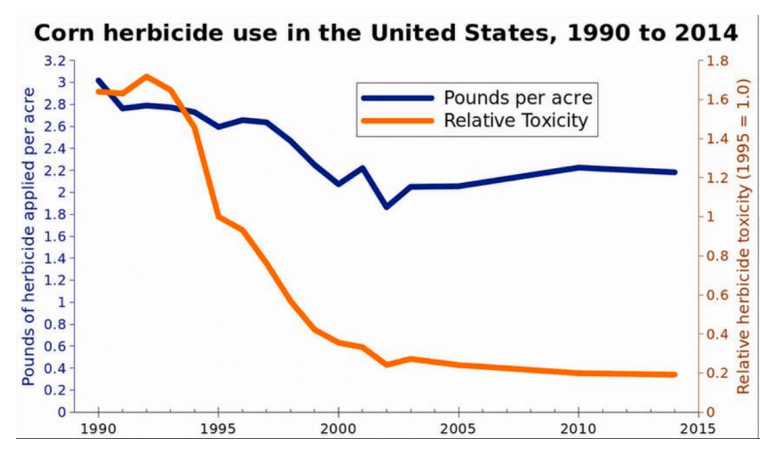 There is a plausible case to be made that wider use of glyphosate took pressure off those herbicides and contributed to this lower rate. 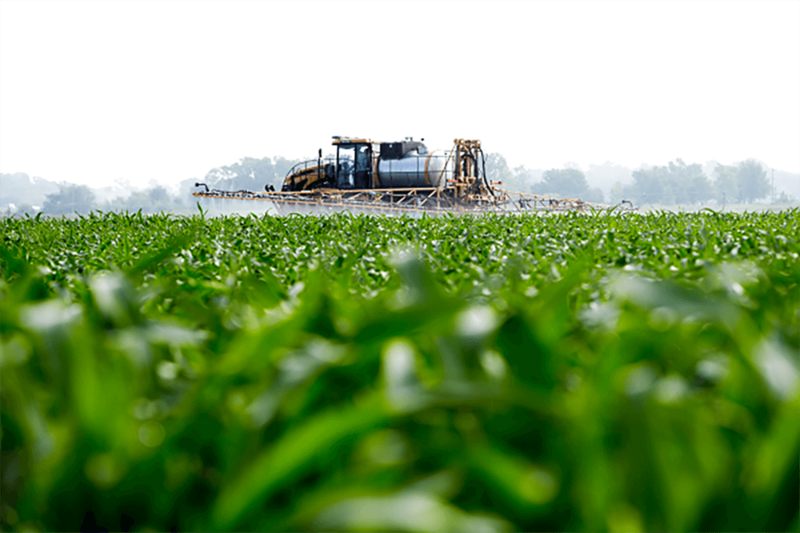 It might also be the case that the overall pressure of herbicide resistant weeds started hitting an economic tipping point for farmers so that it became unavoidable to start taking integrated pest management more seriously in weed control. 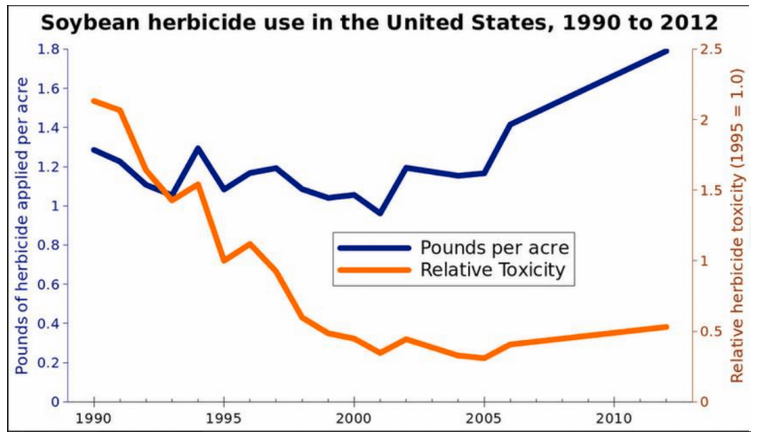 Either way, the data cuts against the popular narrative of herbicide-resistant weeds as an accelerating problem. Now, resistance in palmer amaranth (pigweed) is an accelerating problem – for interesting reasons. We’ll talk about how that relates to the Dicamba debacle when we wrap up in part three.